One of the more interesting young players in Japanese baseball this season and in years to come should be Hanshin Tigers rookie catcher Ryutaro Umeno. 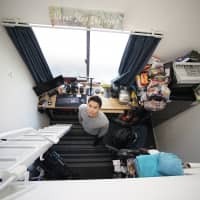 The 24-year-old native of Fukuoka Prefecture was Hanshin’s No. 4 choice in the autumn 2013 amateur draft but got some playing time during last month’s exhibition season and made the Tigers’ Opening Day roster. 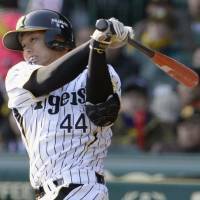 He did not start but played behind the plate in Hanshin’s first four games of the regular season and got his first hit in the third game last Sunday against the archrival Yomiuri Giants at Tokyo Dome. The Tigers are hoping he can mature quickly and become the first-stringer at a position that has been a weak spot on the club since the retirement of Kenji Johjima two years ago. Tigers American pitcher Randy Messenger formed a battery with Umeno twice during the preseason and says, “I love pitching to him. He has a great arm and is good at blocking pitches in the dirt. 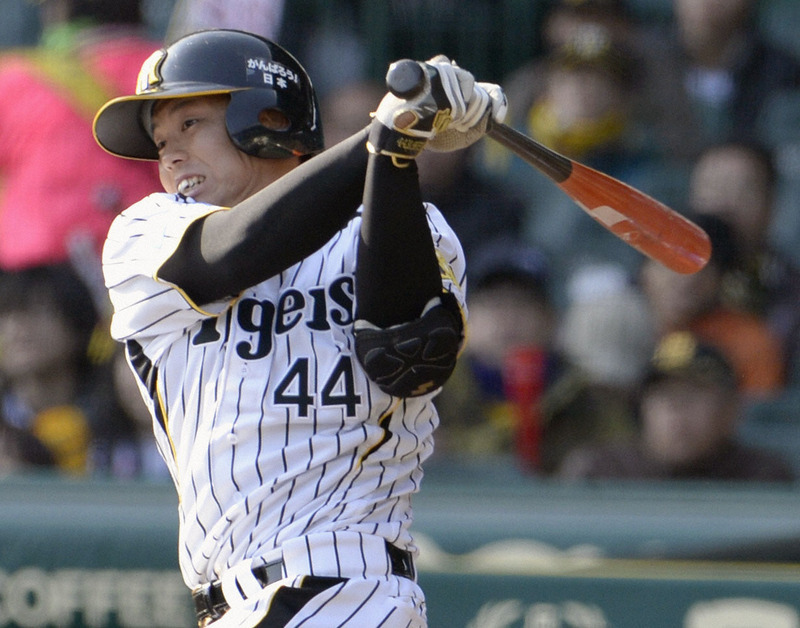 He’s also got some power as a hitter.” That is something Hanshin has lacked sorely in recent years. The most home runs any catcher hit on the team last season was three. Batting coach Tom O’Malley agrees with Messenger. “Umeno’s got some pop,” said O’Malley, and Umeno’s uniform number is a symbol of the long ball in Tigers history. He’s wearing 44, the numeral used during the 1970s and ’80s by former Hanshin American sluggers Hal Breeden, Randy Bass and Cecil Fielder. “What he needs is experience, and it would be good if he were playing every day, either here (on the first team) or on the farm,” said O’Malley. Messenger thinks it won’t take long for Umeno to make his mark. “I would not be surprised if he becomes our No. 1 catcher by the end of this season,” said the pitcher, and we’ll keep an eye on how much manager Yutaka Wada uses the rookie as the year progresses. Major League Baseball and the San Francisco Giants will be honoring Masanori Murakami on the occasion of the 50th anniversary of his becoming the first Japanese player in the majors in 1964-65. MLB will recognize Murakami with the theme, “It All Started With One Man,” at a celebration later this month to coincide with 10 years of operation of the MLB Tokyo office. Then “Mashi” will be acknowledged by his former big league club at AT&T Park before San Francisco’s game on May 15. “It is difficult to believe it has been 50 years,” Murakami, now 69, said last month at Tokyo Dome. He made his debut with the National League Giants at Shea Stadium in New York against the Mets on Sept. 1, 1964. Murakami said he would be delighted if he’s asked to throw out the ceremonial first pitch at AT&T and is looking to reunite with former teammates including Willie Mays, Willie McCovey, Orlando Cepeda, Juan Marichal, Hal Lanier, Jim Davenport and Gaylord Perry. Sadly, several other members of that 1964 San Francisco club have died, including Tom Haller, Jose Pagan, Matty Alou and 1965 manager Herman Franks. The 1964 Giants manager, Alvin Dark, is still living at age 92. I wonder if John Pregenzer will be there in San Francisco to teach Mashi more English next month. Friends & Fans: The 2014 edition of my Japan Pro Baseball Fan Handbook & Media Guide is now available. It is the complete English-language guide to Japanese baseball and includes league and team directories, team rosters, league schedules, profiles of the foreign players, statistics from past seasons, directions to the stadiums, ticket prices and much more, packed into 128 pages. The quickest way to get your copy in Japan is to order directly from me. Please send ¥1,000 in cash, or Japanese postal check “kawase,” along with your name and address, to: Wayne Graczyk, 1-12-18 Kichijoji Higashi-cho, Musashino-shi, Tokyo-to 180-0002. It is also on sale at Tokyo Dome, and fans outside Japan can order through the JapanBall.com website. Yoroshiku.